I came to Guatemala for one reason ...to eat. 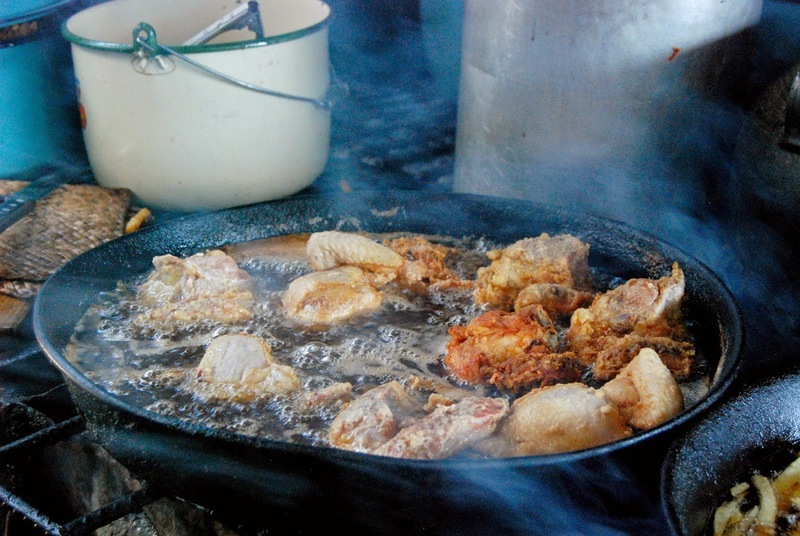 I asked a dozen people who had been to Guatemala what to eat when I was here. Most confessed little or no memory of the food. 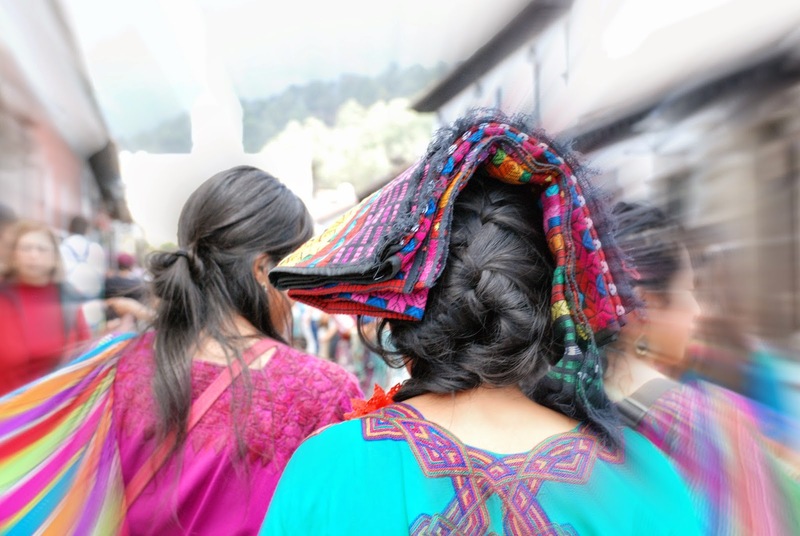 Tourists come for the spectacular textile market in Chichicastenango and Lake Atitlan, the most beautiful lake in the world. They don't come to eat. 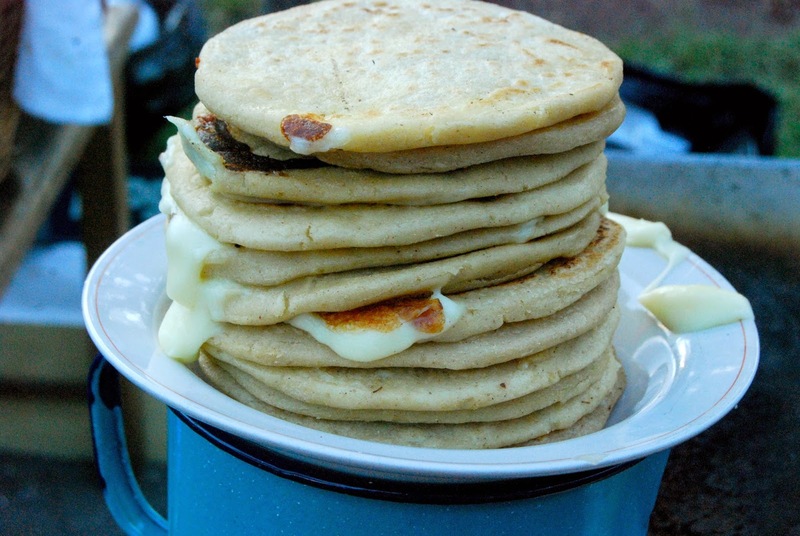 For the past two weeks, I've been looking for reasons to love Guatemala's food. I didn’t have to search too hard. There’s so much good food here and I’ve just scratched the surface. Here’s 15 reasons why you're going to love it, too. 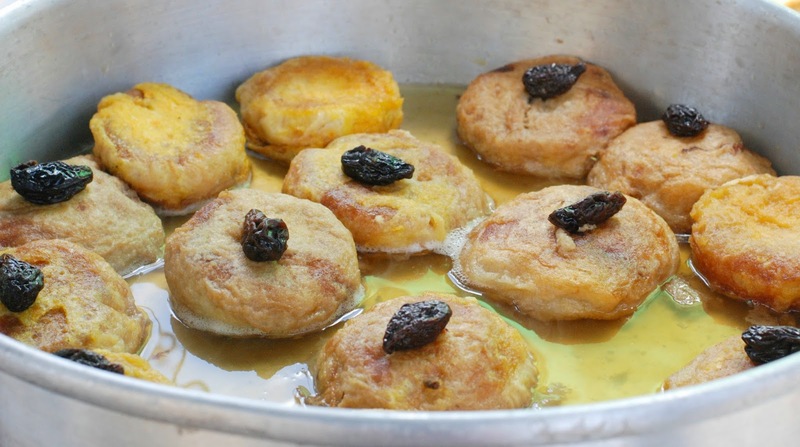 1) My new food addiction: Buñuelos. 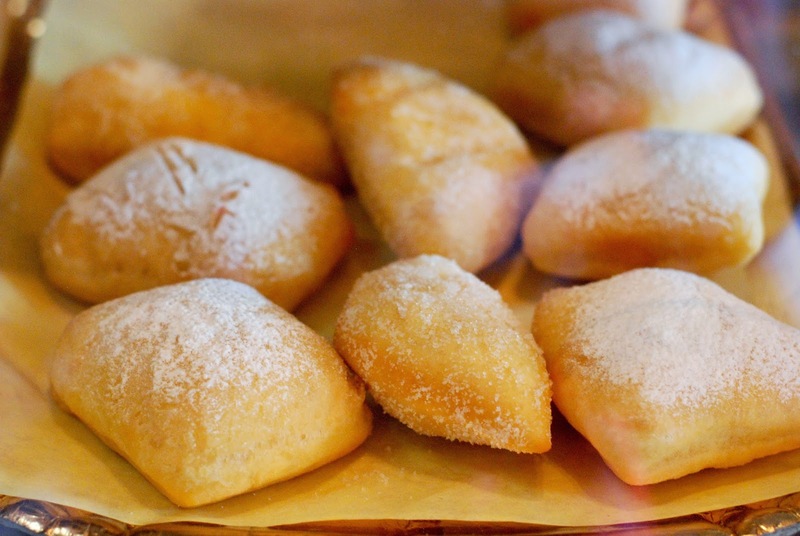 Once you've had a Buñuelo, fried Guatemalan sweet bread served with a warm, sugary syrup, you'll never forget Guatemalan food. 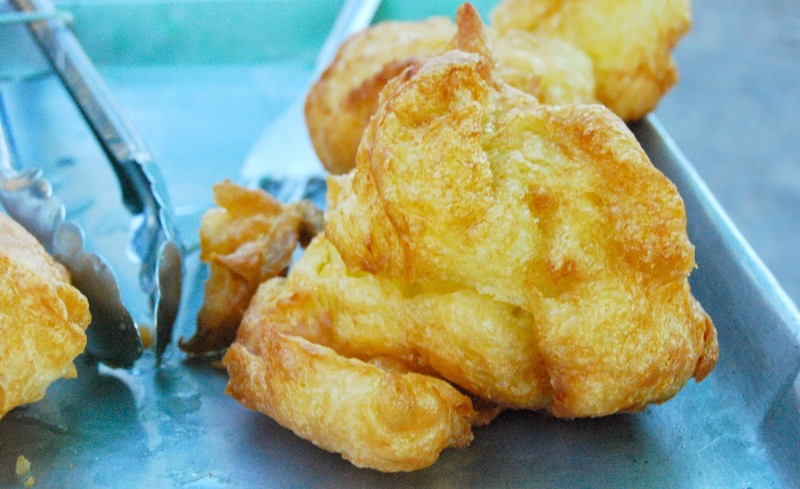 The consistency of Buñuelos reminds me of one of my favorite foods, popovers. These sweet treats are from a street vendor outside La Merced Church, 1 Calle Poniente and 6 Av. Norte 5Q. 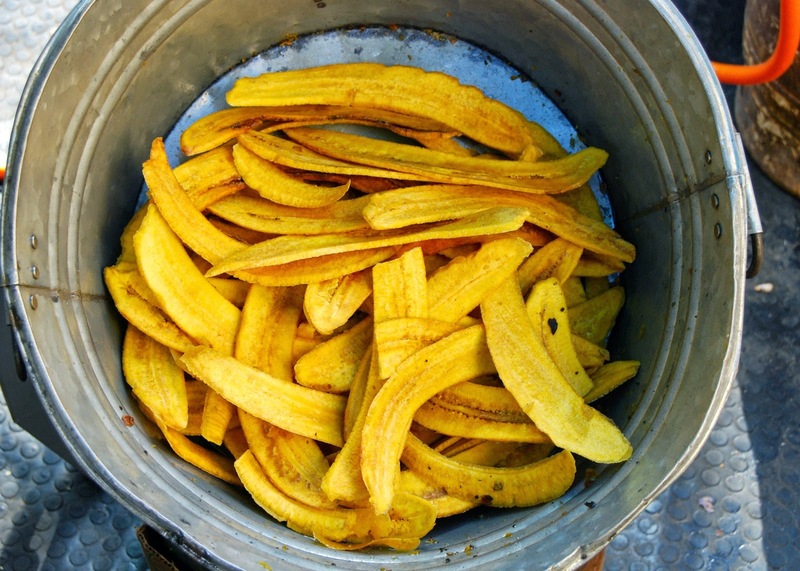 From a hot dog (called shuco dogs) to Texas BBQ, you can find any type of cuisine in Antigua. In fact, according to Trip Advisor, there are 232+ restaurants in Antigua. This local sandwich comes from La Parrilla, 4 Calle Poniente #5. 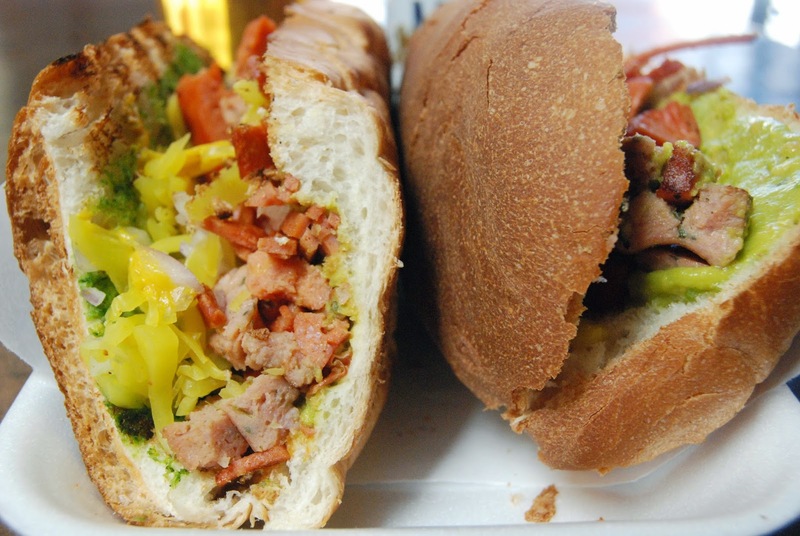 It's made with Salchicha (the hot dog), chorizo, longaniza (the white sausage) and salami and is served with guacamole, mayo, boiled cabbage and mustard. Like the Chicago dog, they have the good sense not to add ketchup. 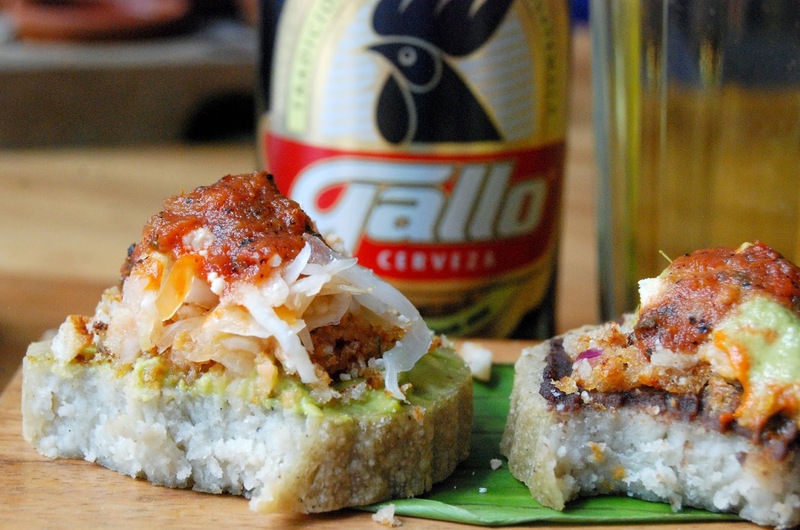 With an ice-cold Cerveza Modelo Especial, this lunch will run you 40Q. 10Q just for the sandwich. This pulled pork sandwich with cole slaw (is this Texas or Carolina?) 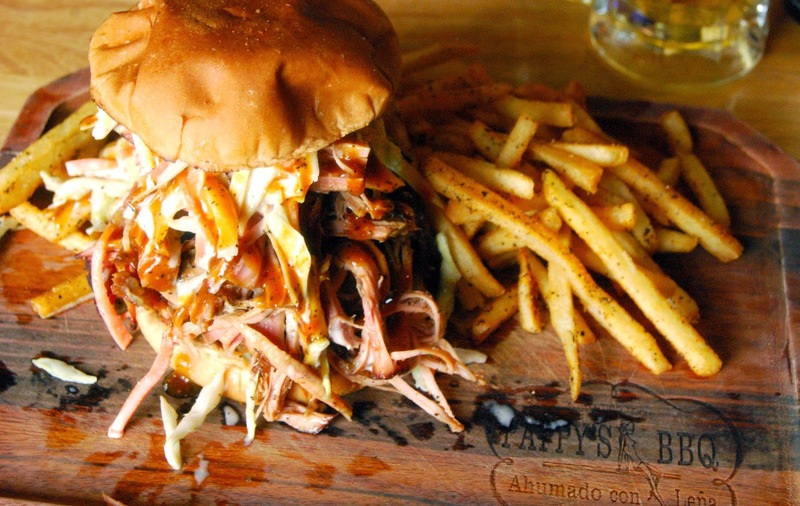 is piled high at Pappy's BBQ, 6a Calle Poniente #21. 62Q. The Friday special is a board of ribs for 75Q. Both are home-sweet-home good. 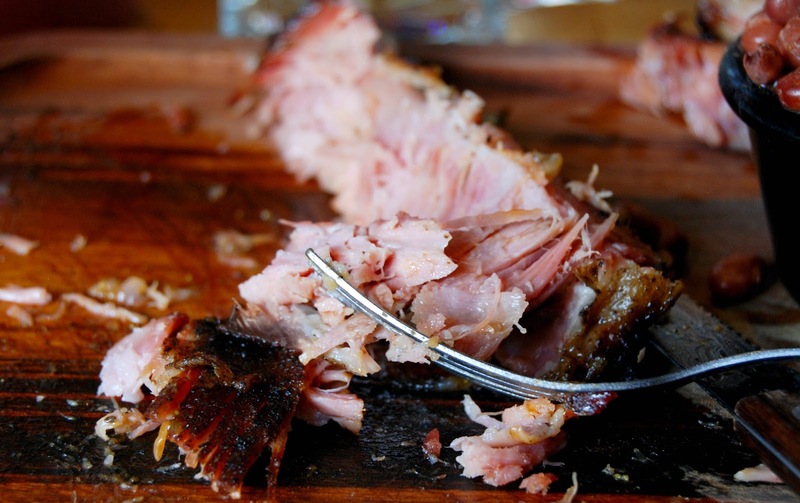 I've also had BBQ ribs at the picturesque Meson Panza Verde, 5th Ave S #19. 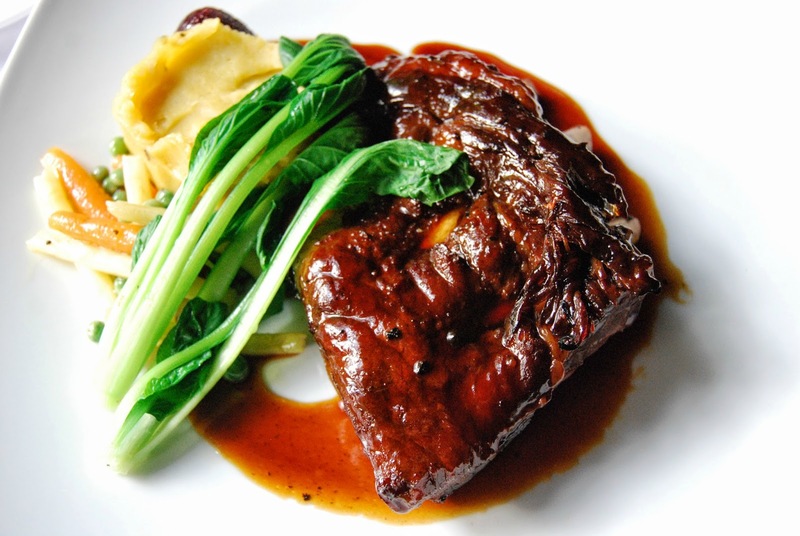 The Asian Pork Ribs were made with Ginger, Star Anise and Soy Sauce and were served with a mound of whipped sweet potatoes.155Q. Beignets almost as good as Café du Monde? 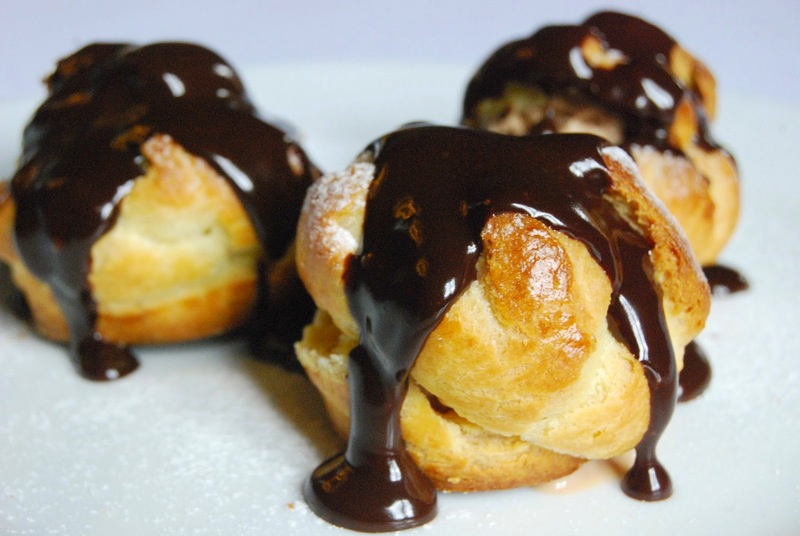 You’ll find them at Epicure Restaurant, 3a Avenida Norte 11B. 5Q. 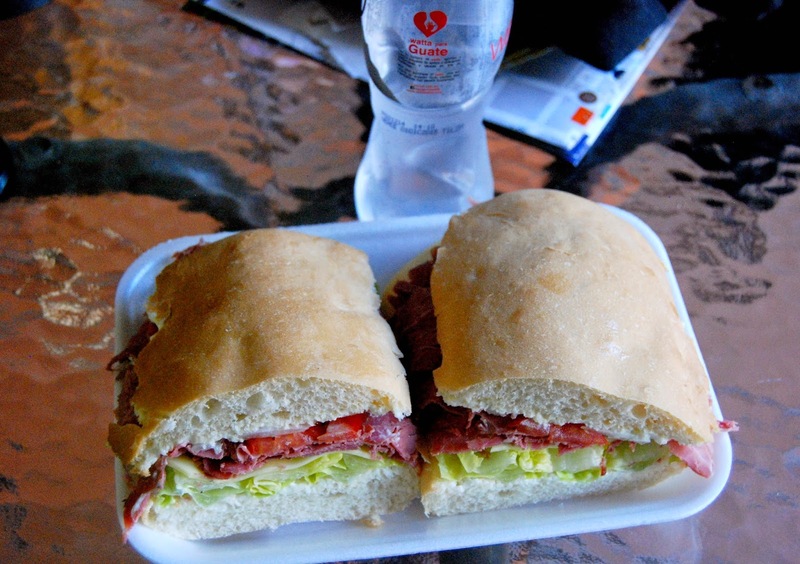 They also have made- to-order deli sandwiches with pastrami or corned beef for 25Q. I never imagined that Antigua's menus would be so diverse. 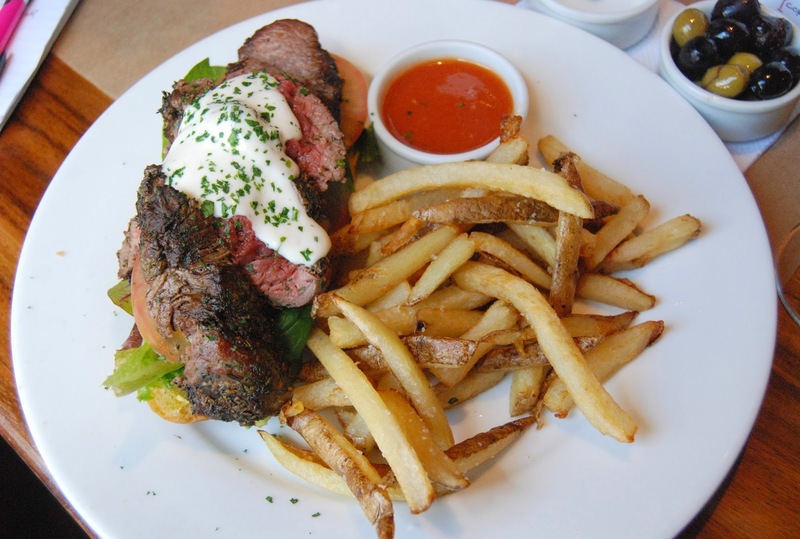 3) Need a restaurant recommendation? After three impressive meals at Bistrot Cirq 5, I had so much confidence in Chef Mario Godinez’s taste buds that I asked him where else I should go to eat. 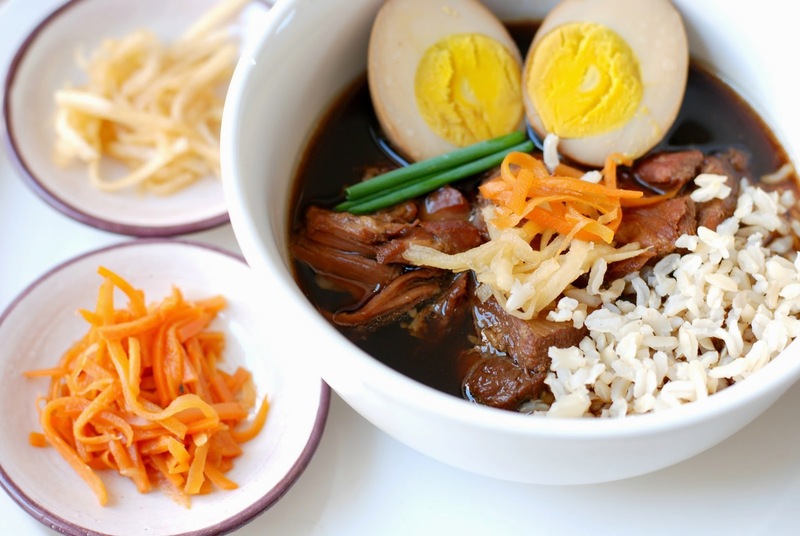 He sent me to a Japanese restaurant called Orgami Organic and Oriental at 6a Calle Oriente #6. This rib bowl was 65Q and a tasty treat for anyone craving healthy, Japanese food. Miwa is from a family of chefs back in Tokyo and definitely has that magic touch when it comes to preparing dishes to write home about. 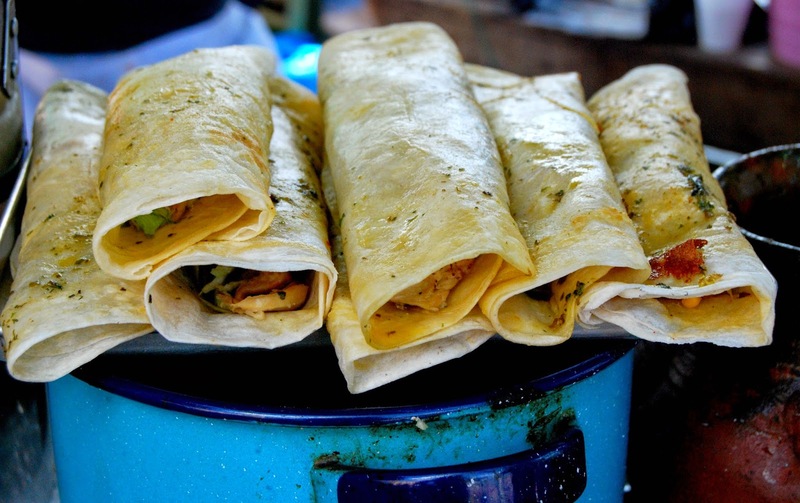 4) The Mexican food you know and love? Never mind that a Mexican Taco = a Guatemalan Taco that's rolled and looks like a Flauta or that a Mexican Tostada = a Guatemalan Enchilada. 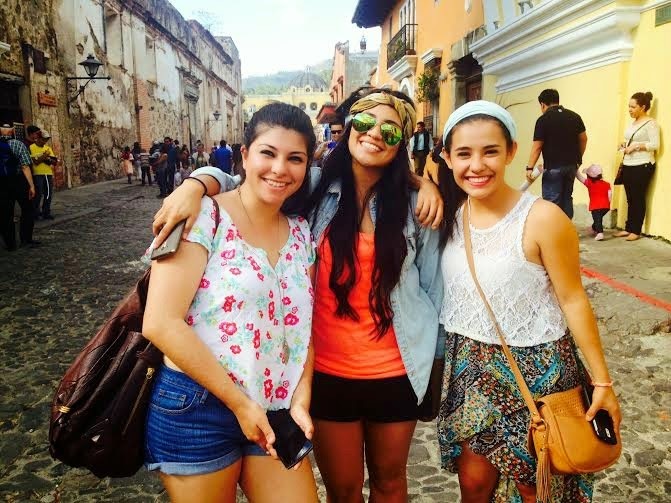 Forget Mexican food while you're here and embrace everything that is Guatemala. You'll be glad you did. We've had one disappointing meal in the past two week. Not bad considering we eat out every day. I will not mention the Mexican restaurant but even the Margarita lacked one essential ingredient...tequila. 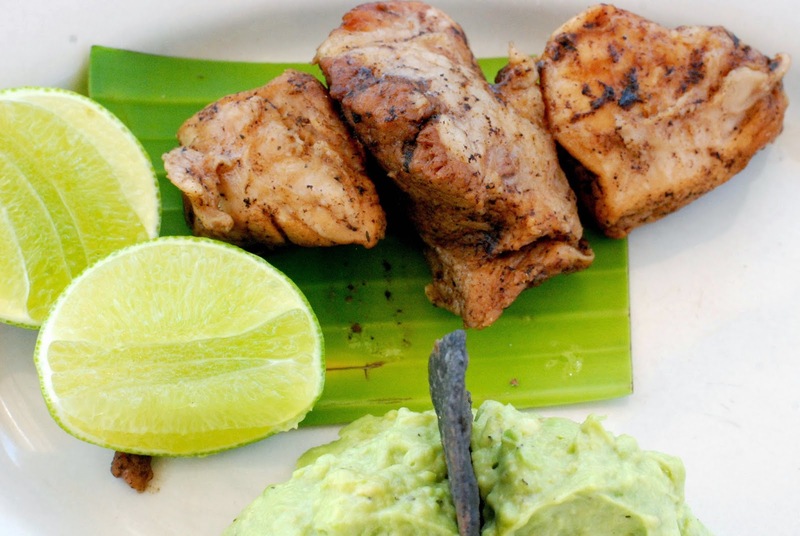 Traditional-modern Guatemalan food is served at Los Tres Tiempos, 5 Avenida Norte 31, just under the Santa Catalina Arch. They have a stunning rooftop patio and pay close attention to the artistic presentation of the food. 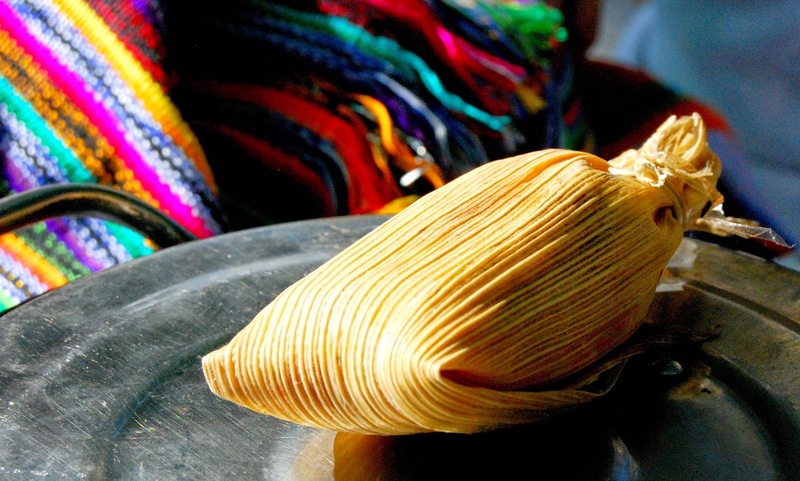 Try the Tamalitos Montados, Q 39 or the Guatemalan version of Carnitas, under 100Q with a beverage. The clientele that day was primarily Guatemalan which tells you that the kitchen is doing something right. All of this pre-trip research didn't lend a clue to the fact that Antigua has so many French restaurants. The master of them all is Chef Mario Godinez of Bistrot Cirq 5, 4a Calle Oriente #7, who did it again with his take on Arrachera smothered in miniature, french-fried onion rings. 175Q. 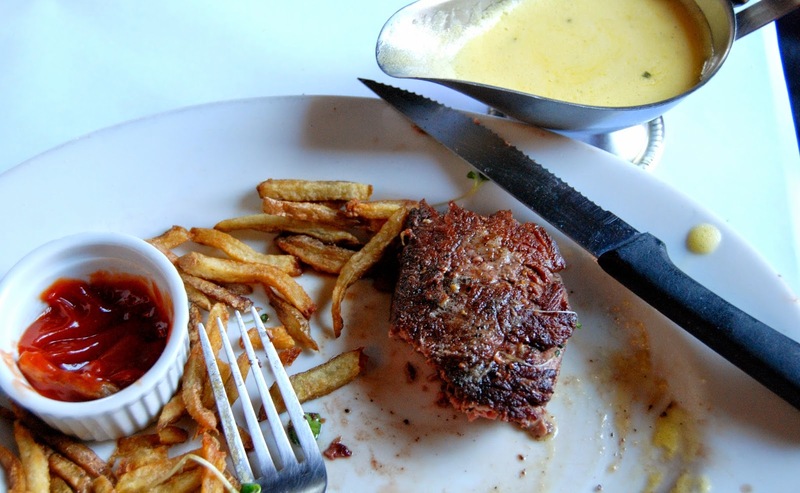 Earlier in the week, we tried his version of Steak Frites which were à la perfection. 145Q. I would eat at Bistrot Cirq 5 every day if I could because French just doesn't get any better than this. 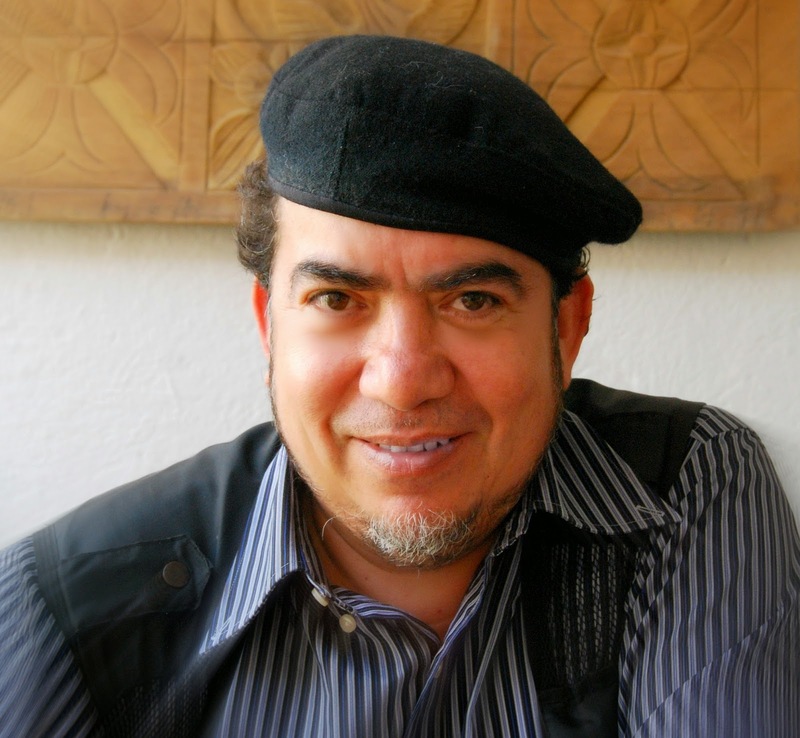 Food Blogger that is, so I went to the source, Rudi Girón. Since 2006, La Antigua Guatemala Daily Photo blog documentary has been using photographs and narratives to illustrate everyday life in Guatemala and includes a very detailed section on the local cuisine. He's a walking, talking authority on all things Antigua and conducts the ever popular Antigua Photo Walk, which is rated #6 of 105 things to do in Antigua on Trip Advisor. 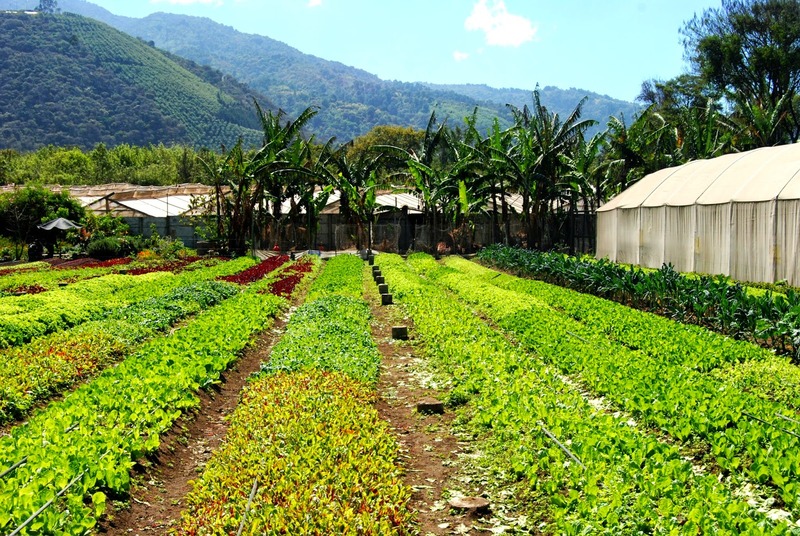 At 5a Ave Final Sur, this farm supplies many of the restaurants in Guatemala with just-picked, organic produce. 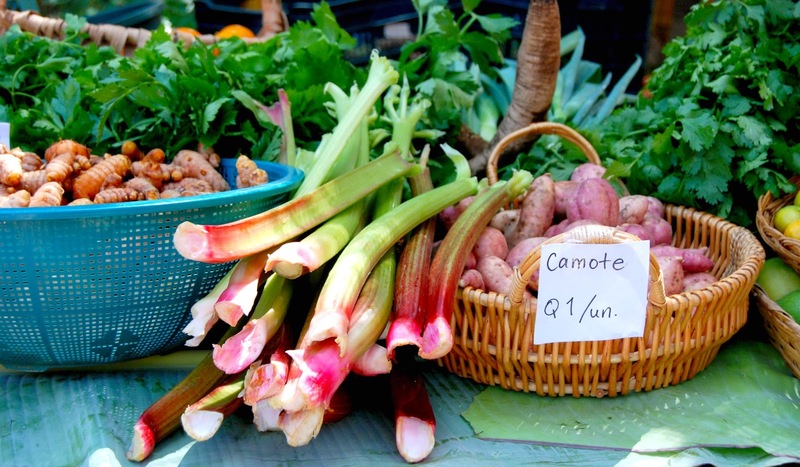 A fairly new Farmers Market is held once a month. We enjoyed this one March 7th, which included a walk of the splendid grounds. 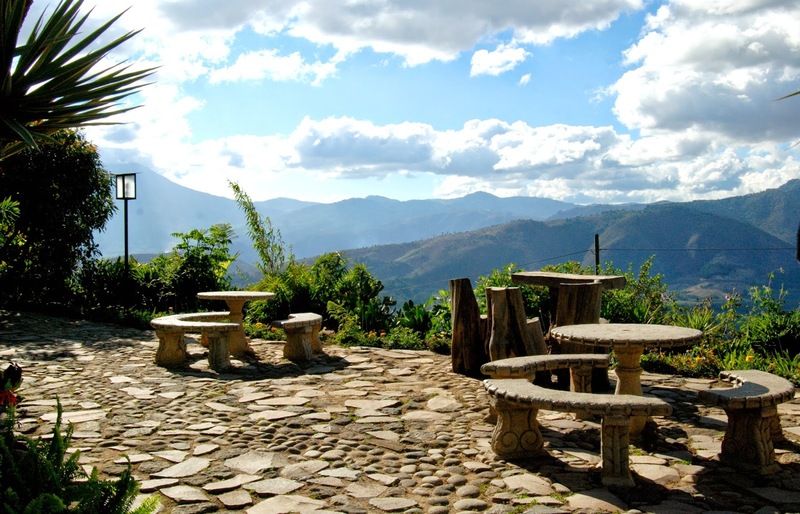 This mountain lodge and avocado farm is located just outside Antigua. Want a breathtaking view? Overnight in one of their tree houses. With a private bathroom and that all important hot shower, it runs 280Q. This restaurant is perched on the hill in San Cristobal El Alto, a 15 minute shuttle ride from Nim Po't Centro de Textiles Tradicionales at 5a Avenida Norte 29 in Antigua. It has a small organic farm so handpicked vegetables are along for the ride on the shuttle back to town. Don't be in a hurry; the shuttle runs whenever and is often over packed buts it's worth a visit just for the views. Their orchid greenhouse has 2,000 + orchids so something is always in bloom. are on the streets but you don't have to hike all over town to find them. Just go outside many of Guatemala's churches. These street vendors, at La Merced Church, 1 Calle Poniente and 6 Av. 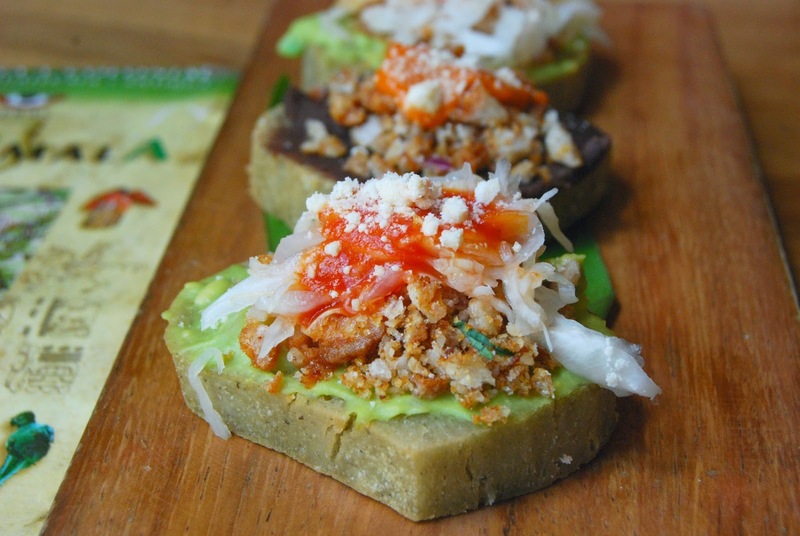 Norte, were dishing out some of Guatemala's most beloved classics. 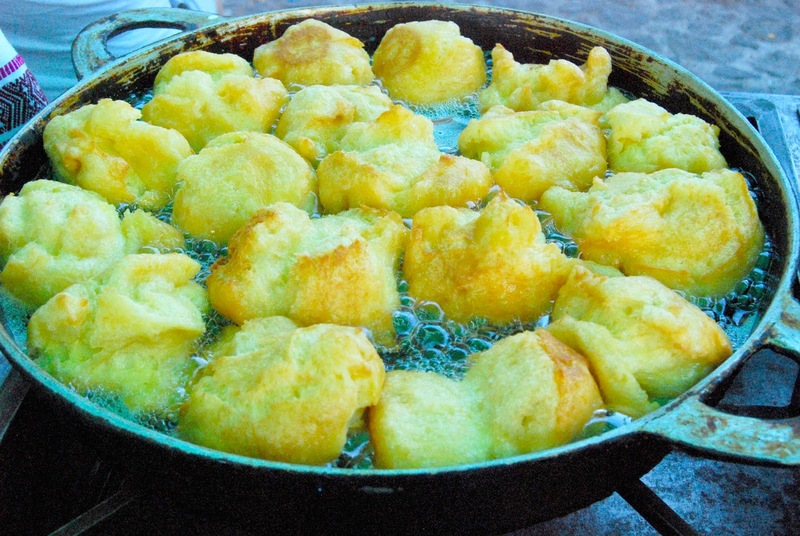 Also visit Iglesia El Calvario, Alameda el Calvario final, where the Buñuelo vendor is reported to be the best in Antigua. 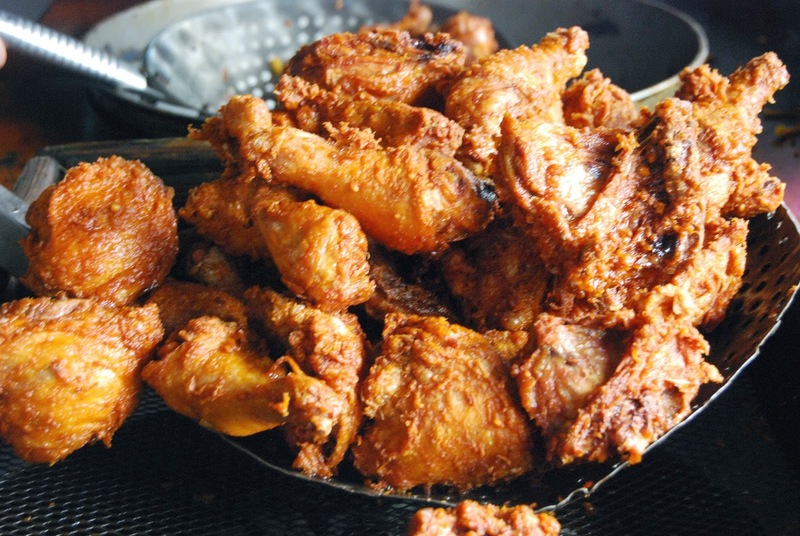 From the markets in Chichicastenango and Antigua to Pollo Camero, the local brand of your grandmother's best, this part of the world loves fried Chicken too. 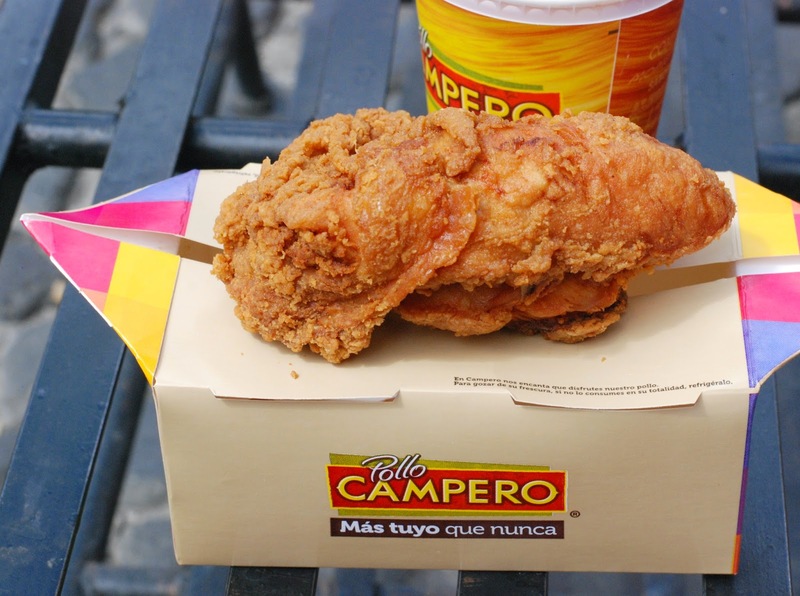 Pollo Camero is at 5a Avenida just 4 doors down from Central Park going towards the arch. Fries, a chicken breast and leg and a drink is 43Q. 15Q for a breast. Ask for extra crispy. We lunched at this wildly popular food truck and like most food trucks, it has ridiculously good food. I'm not a huge fan of meatballs but we loved theirs. 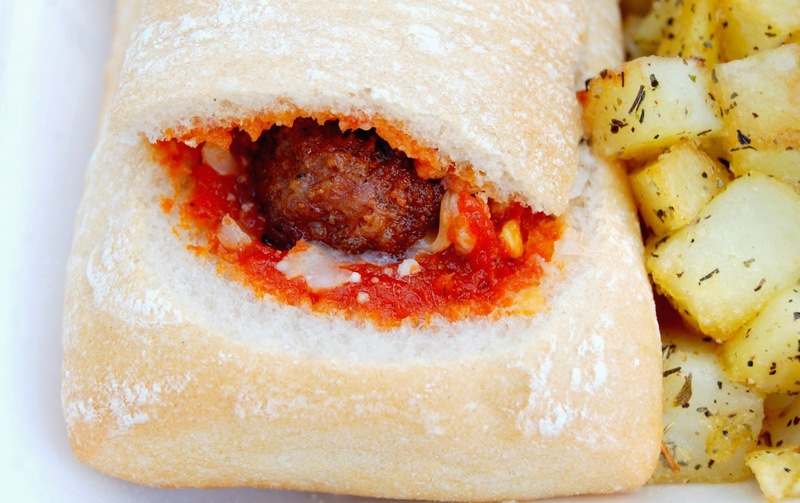 The sandwich was easy to eat; not overloaded with either meat or sauce. Their secret? Like any great sandwich, it’s all in the bread. Check out their Facebook page for an exact location before you go. Sobremesa owner Alex Ferrar was described to me as wonderfully funny and a bit crazy in a good way. How about a genius? 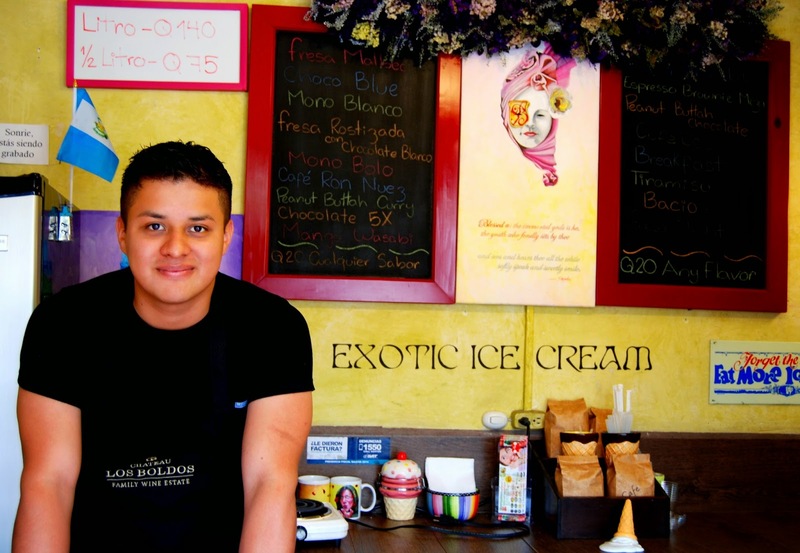 He's the mastermind behind Exotic Ice Cream, located on 4 Ave between 3rd and 4th street. 20Q. Mono Bolo? 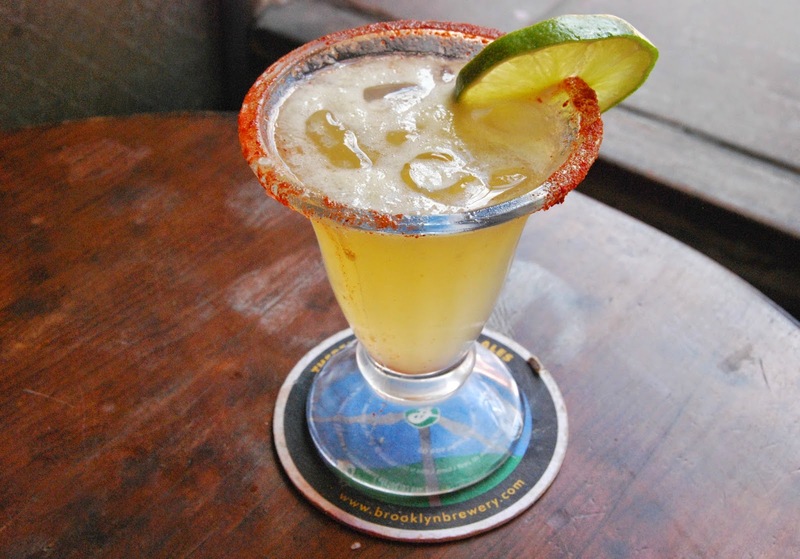 Translated, that’s Drunken Monkey; a delicious blend made with Macadamia nuts, white chocolate and of course tequila. It was sensational. Another mixture was simply called Breakfast: Coffee, maple and bacon. They were getting ready to do a photo shoot for the New York Times when I was there. 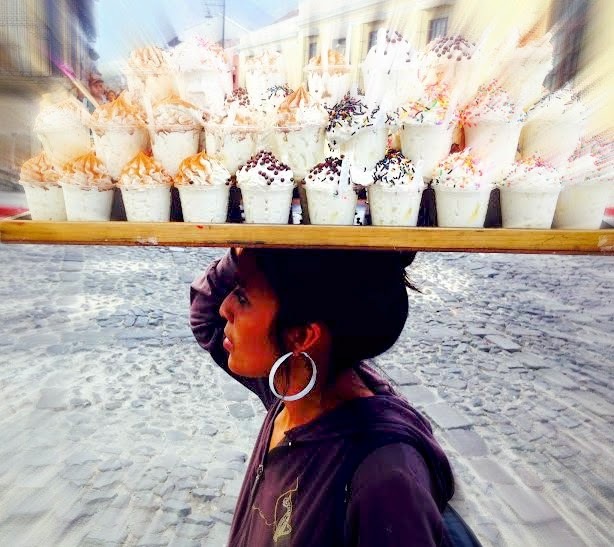 If you don’t know, now you do…Exotic Ice Cream rules. Guatemalan coffee is some of the best in the world. It's full bodied, more so than other Central American coffees, and has a flavor that has been described as both spicy and rich. I would also add that it has heavy notes of Chocolate. No wonder I like it so much. 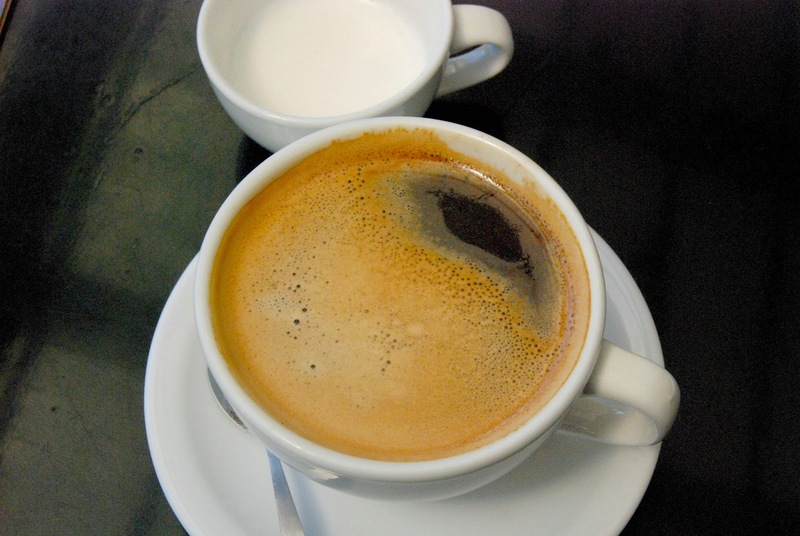 This cup of cafe con leche is from El Sol Café in the Central Jardin. 16Q. You’ll meet a lot of locals at El Sol Café after you've sunk in to the pace of a city or you can compare food notes with globe-trotters from around the world. In particular, a large number of Europeans visit Guatemala each year. One thing for sure…both the natives and tourists are really friendly here and you’ll meet people of all ages and nationalities. The good news: Wine is imported, mainly from South America. 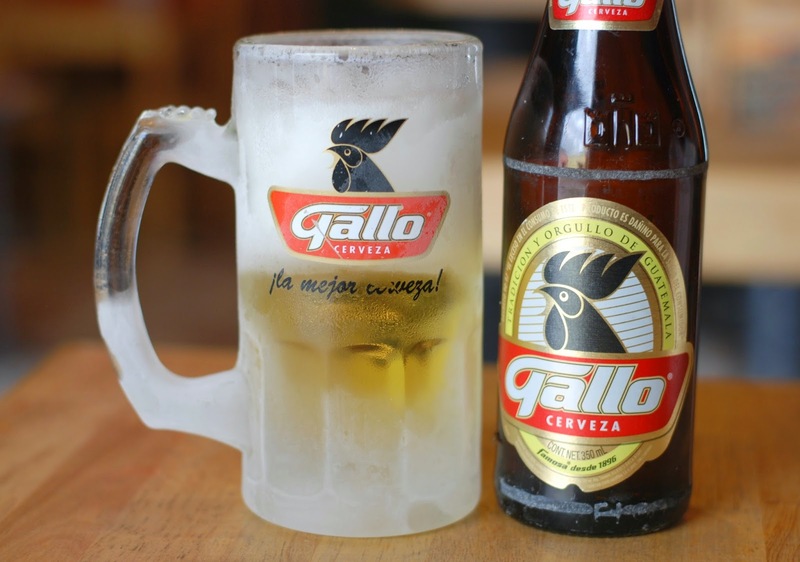 The bad news: Don’t expect Guatemalan prices for a high-quality glass. Hector’s Bistro, 1st Calle Poniente, has a nice Viura Infinitus Spanish Chardonnay for 45Q a glass to go with their magnificent open faced beef tenderloin sandwich. 85Q. At Bistrot Cirq 5, 4a Calle Oriente #7, indulge in a glass of Rio Claro Chardonnay from Chile for 50Q or head for Meson Panza Verde, 5th Ave S #19 and try a glass of Adobe Reserva Chardonnay D.O. Valle de Casablanca 2013. 65Q a glass. 225 for the bottle. Tartines, 4 calle Oriente #1C, also serves a good red, a 2013 Chilean D.O. Valle Central Misiones Drengo Carmenere, for 40Q a glass. 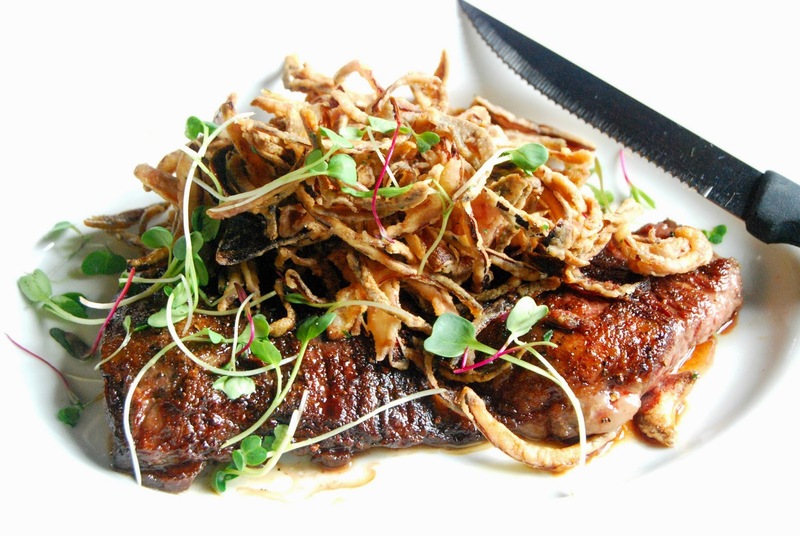 They have nice views from their rooftop so go for sunset and try their pepper steak. 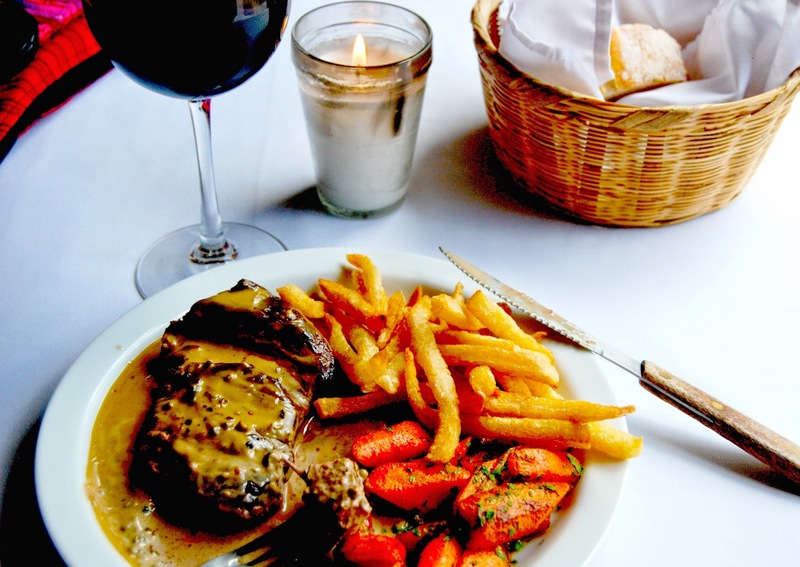 A lot of fresh pepper and a few tablespoons of sauce would have been perfect to flavor this steak so ask for the sauce on the side. 165Q. If you came to Guatemala to drink good quality rum, you’re in luck. Fantastically smooth Ron Zacapa was the first rum to be included in the International Rum Festival's Hall of Fame. The House Above The Clouds is Ron Zacapa's aging facility located in the highlands of Quetzaltenango, 7544 feet above sea level. Just like aging Sherry, they use the Solera method to achieve its tantalizing flavor and perfect balance. This high-end version runs $160 US per bottle. 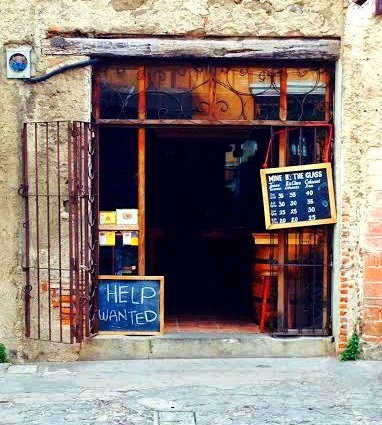 A taste can be purchased (100Q) at the charming, little wine bar called Tabacos Y Vinos, 5a Avenida Norte No 28 B, Calle Arco. 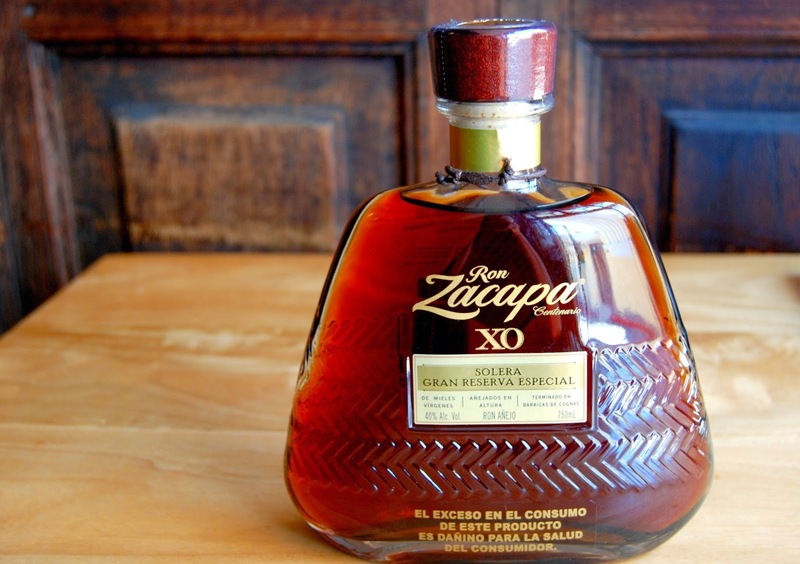 Ron Zacapa will get you on the first sip and you're not likely to forget Guatemala's distinctive drink profile ever. The taste is remarkably intense with peaks of brown sugar, oak, toffee, cedar and tobacco. I know beer is a great thirst quencher when drinking the water is not an option but beer for breakfast?